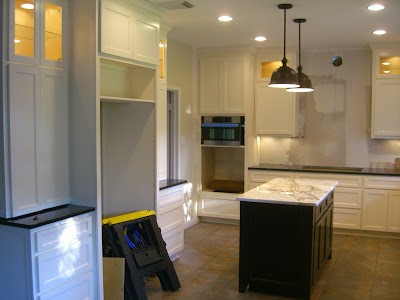 Now in the fourth week of work, the kitchen remodel end is in sight. Yesterday the island was bolted to the floor, the electrical outlets in the island were installed, and the pendants over the island were hung. Three holes were drilled behind the sink for faucet, soap dispenser and air switch, waiting for the plumber to hook them up this evening. Moldings are going in over the fridge wall cabinets, but there has been a tiny hitch there. The counter top on one side is 1/2" lower than the other side, due to tile on one side but not the other. This led to a gap at the ceiling, but that side is being raised today to solve the problem. Appliance installation started on Tuesday, but the installer seemed totally unfamiliar with the Miele appliances we selected. After having to demand that he move the dishwasher back so that it didn't extend two inches past the granite and watching as he tried unsuccessfully to put the trim kit on the speed oven in the corner, we pulled the plug. A different installer that we had spoken with back at the beginning of this adventure, who doesn't need to read the cryptic German installation diagrams because he has done it before, is coming this afternoon to continue. With such a large investment in equipment, we don't want to have something installed incorrectly to void warranties. I particularly don't want to see my glass hood crashing off the wall. Appliances this afternoon. Plumbing tonight. Refrigerator delivery in the morning. 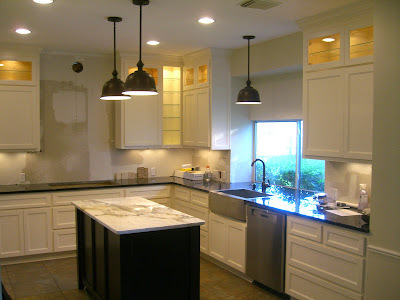 Backsplash installation tomorrow. All the big things should be done this week.